Do lasers get rid of bunions? 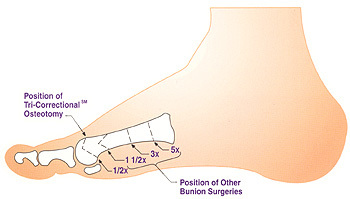 What's unique about our approach to bunion correction? Do bunions ever come back? When should I have my bunions corrected? Results of the Tri-Correctional Bunionectomy? What happens if I have arthritis in my joints? What is my foot going to look like after surgery? "The outcomes speak for themselves." Often minimal walking for as much as four months. Patients cannot wear shoes for prolonged periods of time. Performed under a local anesthesia on an outpatient basis. Requires a surgical screw beneath the skin. Most patients usually return to shoes within two weeks. What happens if I have arthritis in my joint? The nature of a bunion is a malaligned joint, it's not just a bump. As the joint continues to function out of alignment, the bunion deformity gets worse. Some bunion deformities worsen more rapidly than others, but they all get worse with time. Special doctors called rheumatologists treat the many varieties. Generally, patients with bunions, have osteoarthritis, or a wearing down of the joint. 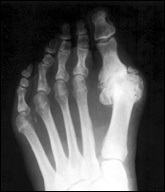 The longer the joint is crooked and the longer the joint is malaligned, the greater the chance for the person to develop arthritis of the big toe joint. Below: The joint on the left is arthritic. Cartilage should be intact, not worn out, and shiny & white like the joint on the right. The foot is a highly mechanical apparatus. What's surprising is how important this joint really is. Try walking without bending your big toe, it's like trying to drive a car with a flat tire. This is why so many people with big toe problems have knee and back pain as well. As the osteotomies are moved farther away from the big toe joint, the bending torque moment becomes higher. Higher bending torque moment creates more stress in the area of the bone cut, which can prolong recovery time. Other bone surgeries are done similarly, but there is an advantage in performing surgery at the end of the bone to minimize torque, which is our "secret" ingredient in the Tri-Correctional Bunionectomy. Not only do we minimize torque at the end of the bone, but the quality of the bone used is better closer to the joint. The better the quality of bone, the faster the bone heals. Our goal in creating the Tri-Correctional Bunionectomy was to minimize torque so that we can get you back to your activities as quickly as possible. What is my foot going to look like at the end of surgery? Most of our patients experience minimum discomfort. The majority of our patients are in shoes after two to three weeks. With traditional bunion surgery, a return to shoes has often been delayed by pain, swelling, and the inability to walk because of pins or bone instability. The use of a surgical screw significantly reduces pain and swelling. Security of the bone realignment usually allows for immediate weight bearing and ambulation (walking), without the need for full-leg casting. Patients are generally ready to begin wearing shoes in ten days after surgery. Traditionally, pins and wires have been used to hold the alignment of the bones. The pins stuck out of the foot and prolonged the return to shoes by as much as a month or longer. The surgical screw we use is placed beneath the skin and is much more stable than pins. To ensure the best possible results, patients enter a program of vigorous rehabilitation to help with the healing process and increase the flexibility of the corrected joint. Now there is no need to be afraid of bunion correction any longer.